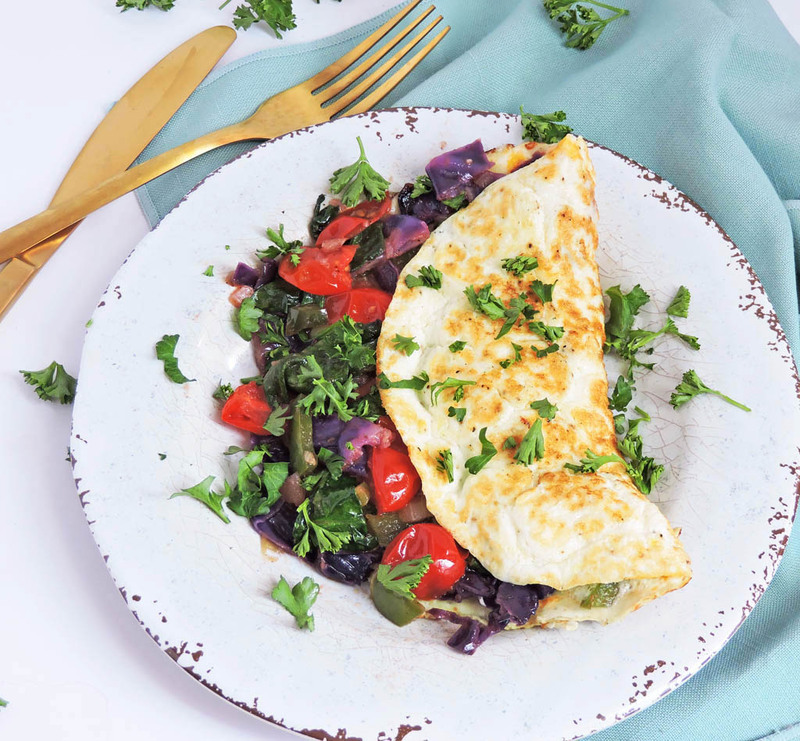 If you’re looking for a quick, easy, and healthy breakfast option then you’ve GOT to try this Veggie Stuffed Egg White Omelet! Not only is it delicious, but it’s packed with a great source of protein to get you through the day! I don’t know about ya’ll, but I hardly ever get the chance to spend hours preparing a gourmet feast for my family! I mean, let’s be real…does anyone ever have the time to do that?? 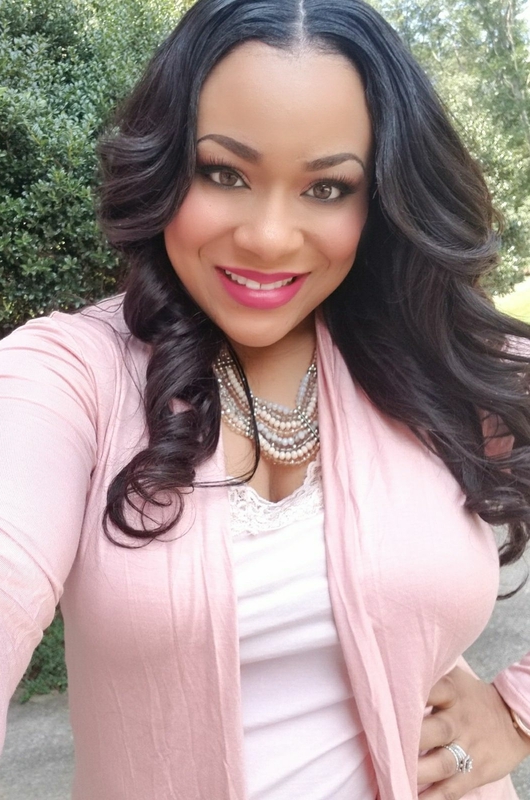 Well maybe if I was on one of those Real Houswives shows…then I would definitely have time! No, wait…if I WAS on one of those shows, I would probably hire someone to cook for me! Lol! Now, what were we talking about again?? Lol! 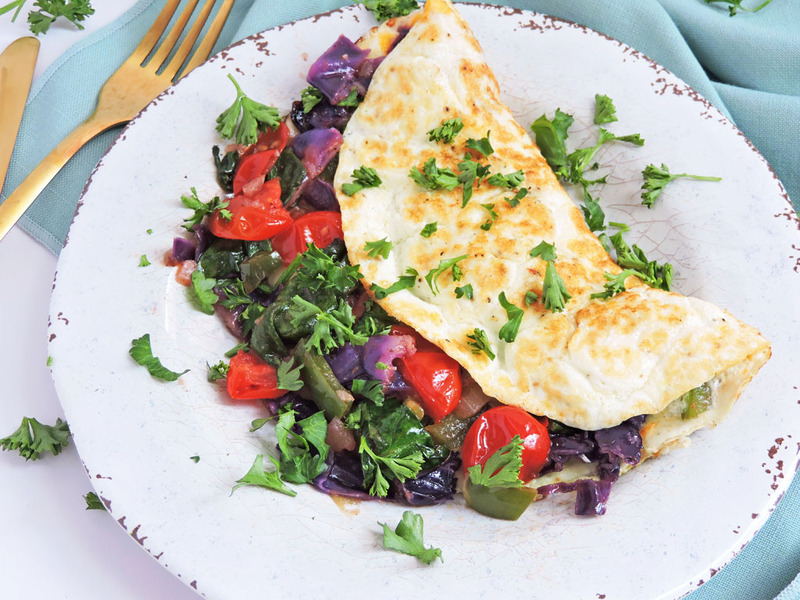 Oh yeah, that’s right…this delicious Veggie Stuffed Egg White Omelet! 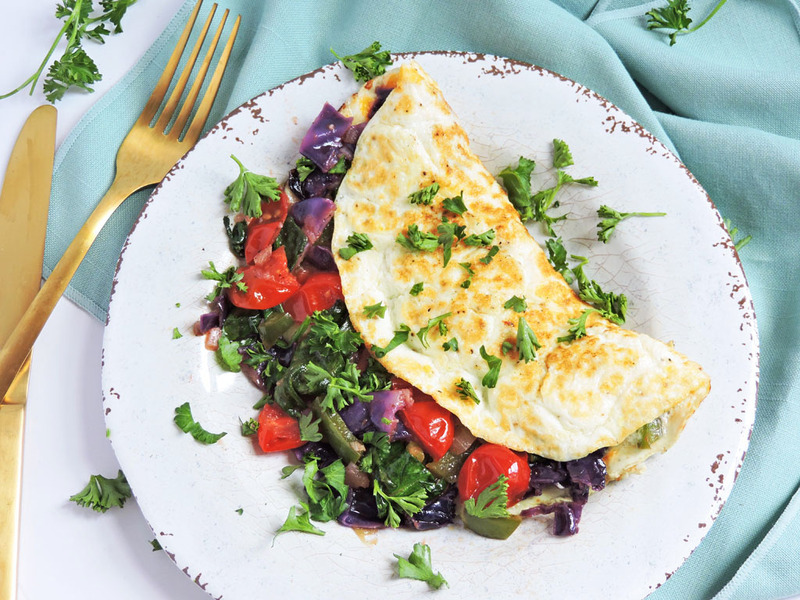 This omelet seriously took very little time to prepare! As you all know by now, I have 2 very busy toddler boys! They are the cutest little things, but they don’t leave mommy with very much spare time, so most of my meals have to be super quick and easy! In addition to making sure that my recipes are quick and easy, I also like to make sure that they are nutritious! I love making omelets and frittatas (such as this Kale, Tomato, and Mushroom Egg White Frittata) because I can literally throw in any combo of veggies and it’ll turn out fabulous! For this Veggie Stuffed Egg White Omelet, I went into my fridge and cut up almost every veggie I had on hand! 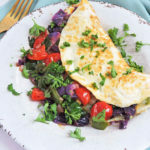 I usually use spinach and tomatoes in my omelet recipes, but I had some red cabbage, mushrooms, and bell peppers on hand so I threw those in there too! I started off by sautéing my veggies and then setting them aside. Then, I whisked my egg whites to make sure they would produce a fluffy omelet, and added it to my skillet. I added the veggies to one side and flipped it when the egg whites were done. This veggie combo was absolutely amazing and fulfilling! Egg whites contain a great source of protein to help get you going throughout the day! This is a super easy breakfast that the whole family will enjoy! 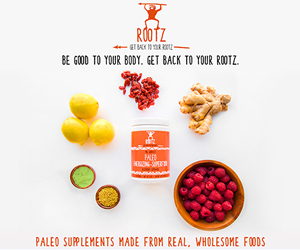 Be sure to follow me on Instagram and Pinterest for lots more healthy recipe inspiration! Heat skillet to medium heat and add oil. Add in garlic, red cabbage, bell pepper, mushrooms, and grape tomatoes. Cook until cabbage and bell peppers are tender. Toss in spinach and season with salt and pepper to taste. Remove from heat and transfer veggies to a small bowl. Cover to keep warm. In a medium bowl, whisk the egg whites, water, and a pinch salt and pepper until frothy. Lightly coat a medium nonstick skillet with cooking spray and heat the skillet over medium heat. Add half of the egg whites to skillet, swirling to evenly cover the bottom of the pan. Cook until set, about 1 1/2 to 2 minutes. Using a rubber scraper lift the eggs up and let the runny uncooked egg flow underneath. Spoon half of the veggie mixture onto half of the omelet, sprinkle 1 tbsp of cheese (if desired), fold over, and slide onto a serving plate. Repeat with remaining egg whites and veggie mixture. I agree. We should all get real about putting healthy meals on our tables. It doesn’t need to be complicated or time consuming. Also, I lived in Texas as a child and think that “y’all” should be adopted by all areas of the U.S. It is simply a contraction of you all, and sounds much more friendly and inclusive than the “you guys” that is used here in Minnesota where I live. Thank you! And I definitely agree with the word, “y’all!” It makes me feel comfortable and welcomed whenever I hear someone say it! ?